Where do insurer middlemen like collision Service Centers fall regarding auto body shop choice laws? A recent Progressive email to a policyholder hyping Service Centers raises the question of if traditional shop choice laws have any relevance to how an insurer markets a middleman compared to an actual body shop. “When you choose a Service Center to manage your claim, you just drop off your damaged car, pick up your rental and go!” states the email to a Virginian who’d renewed his policy. Not only did the email tell him the closest Service Center, it provided a map from his home to the facility. (We redacted these and other identifying elements.) It’s accompanied by a promotional video giving customers a tour of a sample center. As the email indicates, Service Centers aren’t actually body shops. They receive damaged vehicles, send them to shops — presumably direct repair program facilities if the customer has no shop preference — and dispense rentals. 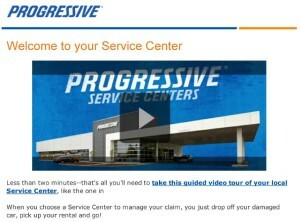 Progressive says this makes the claims process easier and cuts two days off of cycle time. That’s a fair consideration. But does pushing one of these middleman facilities let insurers get around laws which mandate customers given shop recommendations be reminded they can patron anywhere? Nowhere in the Progressive email or video accompanying it is there any mention that the service center has an interest in the shops it would presumably recommend or that a customer has no obligation to use Progressive’s recommendation. That seems to for practical purposes offer a loophole: Customer is told of Service Center through email. Customer takes car to Service Center after suffering damage. Service Center offers the appropriate disclaimers about shop choice and offers suggestions. But at that point, the customer’s probably not likely to pack up and drive home to research non-DRP shops. Asked if such emails violated the spirit of the law, Progressive described the Virginia communication as marketing. It’s rare that such a scenario would happen, according to Progressive. Few customers report claims at Service Centers.